Bucket & Drum Heaters | Gordo Sales, Inc. Drums, buckets and barrels are some of the most shelf-stable and cost-effective storage options available in many industries. But when they’re used to store fragile materials such as food or toxic substances such as chemicals, epoxies and resins, they require optimal thermal protection. Each material has specific temperature requirements to maintain quality and extend shelf life. Protect your products with our line of specialized bucket, barrel and drum heaters and related heating devices. We have integrated thermal solutions for warming food, keeping products in liquid or solid stage, mixing and melting liquids, and storing chemicals at ideal temperatures. Our products include heating mats and jackets, submersible temperature controllers and input devices. Select among a range of materials, sizes, dimensions, electrical specifications and configurations. Quick and easy installation — Your workers can easily set up our systems. Our temperature controllers are also easy to set up, use and maintain. 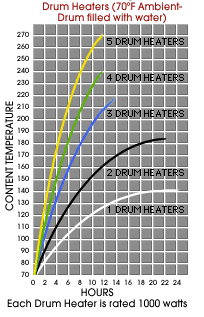 Improved product longevity — Our drum heaters and thermal devices allow for full heating coverage at maximum efficiency. This way, your products heat up quickly to the ideal temperature range during both storage and use, even during fluctuating ambient conditions. Reduced waste and damaged materials — Improper storage is one of the leading causes of material waste. Our complete thermal solutions help keep your operations productive and profitable. Increased safety in your facility — Our solutions not only protect your stored materials from contaminants and hostile conditions, they also keep your workers safe. We are one of the nation’s largest providers of low-cost, high-performance drum and bucket heaters. More than that, we have extensive product knowledge and deliver exceptional service. On some of the more popular drum heaters, we offer quantity discounts, so you can save by purchasing more than one drum heater. We ship nationally (usually within the same day you place your order) and to Canada. Ensure a safe, efficient, and productive operation with our robust drum heaters and thermal solutions. Place your order today or call us for more details about our products.